Madikwe is Big 5 country. Relax and cool off in your private plunge pool. Book a bushwalk to see a different perspective of the reserve. The moment you arrive at Rhulani Safari Lodge, you will be immersed in the adventure of an African Safari. A warm welcome by the staff who will look after you during your stay sets the tone for your stay and makes you feel instantly at home. Rhulani was designed to blend into the surroundings as much as possible and at the same time provide guests with a natural experience allowing guests to see, smell and hear the bush throughout their stay. The warm neutral palette of terracotta, brown and beige is brought to life by added spashes of red and yellow, and beautiful original African artworks are found throughout the lodge. There are seven private chalets, each with a plunge pool overlooking the surrounding savannah. There is air-conditioning to keep the chalet cool in summer and a crackling fireplace to warm chilly winter nights. The rooms are spacious and have large windows and bi-folding doors making the most of the scenery. A tea and coffee station and fully stocked mini-bar are of course standard along with WiFi. The en-suite bathrooms are spacious with a bathtub, twin basins and both indoor and outdoor showers. The family suite has two en-suite bedrooms each with outdoor shower and all the rooms lead out on to the deck where you will find the plunge pool. You can even enjoy massage treatments in the privacy of your own room or on your deck. The main thatched area has an intimate lounge and library leading out the the expansive deck which overlooks the waterhole, here you can relax and watch animals come down to drink. Excellent meals, a combination of local and international fare, take place in the dining room or out on the deck or even at the boma, under the stars with a roaring fire. Game drives take place each morning and afternoon affording the opportunity to experience the wildlife of this area, this is a well-known Big 5 reserve. As an additional extra the lodge can arrange bushwalks for those interesting in seeing the are from a different perspective. Open: The lodge is open all year. Location: The Madikwe Reserve, north east South Africa. Rooms: The lodge has 7 chalets and a family chalet. Air conditioning and a fire place is standard. The chalets have both inside and outside showers and a bathtub. The family room has two bathrooms each with a bathtub and outside shower. Each chalet has a plunge pool on the private deck. Rooms benefit from large windows and bi-folding doors to the deck. A tea and coffee station and minibar are provided along with a room safe. 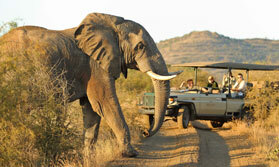 Activities: Game drives take place both early morning and late afternoon. Bush walks can be organised for an additional cost. Facilities: There are spacious grounds and gardens and an outdoor swimming pool. There is a sauna and a fitness centre. The hotel serves food made from locally sourced ingredients. Breakfast and lunch can be enjoyed on the terrace and dinner in the restaurant. The hotel serves a special buffet braai on Sunday lunchtimes. Tea, coffee and snacks are available throughout the day. There is a DVD library free for guest use. There are also lounges and a pub, with open fires on chilly evenings. Communication: There is free Wi-Fi internet access in the hotel and grounds, including in all guest chalets.